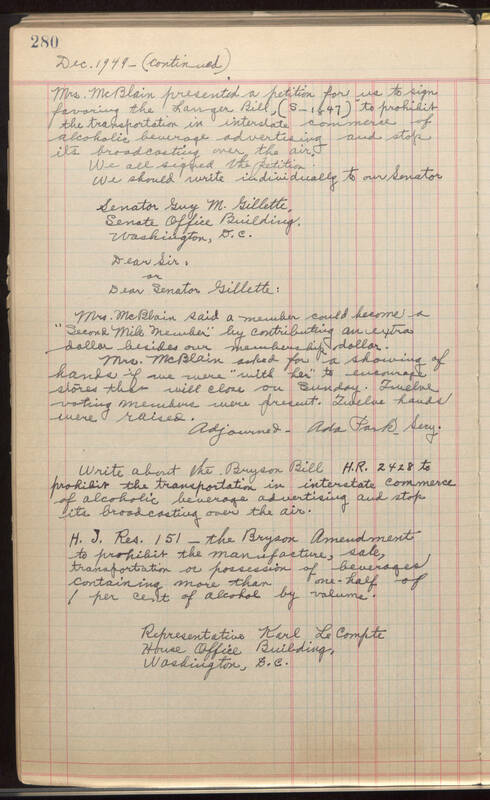 Dec. 1949 - (Continued) Mrs. McBlain presented a presented a petition for us to sign favoring the larger Bill, (S-1847) to prohibit alcoholic beverage advertising and stop its broadcasting over the air. We all signed the petition. We should write individually to our Senator Senator Guy M. Gillette, Senate Office Building, Washington, D.C. Dear Sir: or Dear Senator Gillette: Mrs. McBlain said a member could become a "Second Mill Member" by contributing an extra dollar beside our membership dollar. Mrs. McBlain asked for a showing of hands if we were "with her" to encourage stores their will elore ou Bunday. Twelve voting members were present. Twelve hands were raised. Adjoined - Ada Parks Sery. Write about the Bryson Bill H.R. 2428 to prohibit the transportation in interstate commerce of alcoholic beverage advertising and stop its broad casting over the air. H.J. Res. 151- the Bryson Amendment to prohibit the manufacture, sale, transportation or possession of beverages containing more than one-half of 1 per cent of alcohol by volume. Representative Karl LeCompte House Office Building, Washington, D.C.